← What I’m Watching – The Story of Adele H.
Of the fourteen films I’ve watched for this project so far, One Flew Over The Cuckoo’s Nest might be the first truly great film I’ve seen. Annie Hall is no slouch, but of the rest – Dances With Wolves, Patton, From Here To Eternity, included – none really have the depth or subtext of One Flew Over The Cuckoo’s Nest . Perhaps that’s a personal bias of mine – I can’t imagine what people will say when they realize that, after I watched fourteen films, Platoon could hardly find it’s way into the top ten so far. 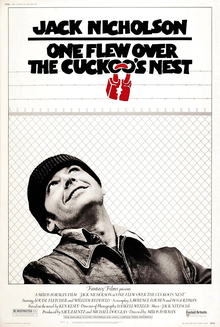 Still, that doesn’t change the fact that One Flew Over The Cuckoo’s Nest is simply a marvelous film. One Flew Over The Cuckoo’s Nest (OFOTCN) tells the story of a man sent to a mental hospital from a prison work farm, after he acts crazy, to get out of his work detail. In the hospital he is a disruptive force to both the staff and the patients, and is constantly bumping up against the head nurse. Still, despite a forceful personality he never reveals himself as crazy. Instead, the head nurse sees in him an opportunist who is more interested in living hedonically than anything else and is determined to break him. A test of wills ensues but despite winning many battles – among the patient’s scheme’s are to escape and steal a fishing boat and to sneak women and booze in for the other patients – he eventually loses the war and is lobotomized after he tries to strangle the head nurse. In the final act he is smothered by another of the patients who frees himself and runs away from the hospital. OFOTCN tells a fairly simple story, of a free-spirited man bumping heads with the establishment, with the expected results. But while the story is simple the context, and the meaning of it, is far from it. The main question it raises is one that has plagued philosophers for generations, specifically, what is it that questions defines crazy? Is a person crazy simply because he doesn’t fit well in the system, or is it something more? And if the system disappears is he still crazy? All of this doesn’t even consider the larger, societal questions and how it is that the main character, counterculture R.P. McMurphy, became the great counterculture hero. While OFOTCN gave us a great counterculture hero, it also gave us one of cinema’s greatest villains, in Nurse Ratched. From time to time lists of the greatest movie villains are trotted out Nurse Ratched is rarely on them, and it’s probably because she’s much too low-key, much too-much of a petty-tyrant to truly be a villain. But considering the method’s she uses in the guise of therapy for the patients in her care, she’s one of the most monstrous characters on film. Despite being a nurse and charged with acting in a therapeutic way she seems less concerned with ‘curing’ her patients as she does in dominating them. She regularly preys upon their weaknesses, which is the source of the conflict betwen her and McMurphy, but eventually leads to the suicide of Billy Bibbit and the lobotimization of a sane man simply because she refused to send him back to his rightful place – jail. Under the guise of ‘help’ she simply destroys her charges, as monstrous an act as Hannibal Lecter eating his patients. Below is probably her best, most devious scene in the movie. Though it’s one of the greatest films ever made, it’s strange to think of the struggles it went through to make it to the screen. Kesey’s book, at the beginning, was another of the counterculture novels that really started to come to the fore in the fifties with the Beats but strangely, unlike osme of their struggles for fame – particularly Kerouac – OFOTCN was an instant hit. The year after publication it became a stage play, eventually starring Kirk Douglas, who also bought the film rights with an eye towards playing McMurphy himself. Despite his star, when he couldn’t find studio backing to make the film he gave the rights to his son, Michael, who finally got the movie made. Because Kirk was well too old to play the part anymore Jack Nicholson took the part himself and so in some sense Jack Nicholson’s victory on Oscar night could rightly be the one, for Kirk Douglas, that got away. At least he had the pleasure of seeing his son, Michael Douglas, win an Oscar for producing. The curious thing is that, even as one of the greatest films ever made, and that even though this film was not by any means an upset winner for Best Picture, it had to overcome some incredibly strong films to win, any of which would have been worthy champions. In the history of the Academy Awards there have really been two years when there were at least five worthy winners amongst the nominees. In 1939, when there were ten nominees, Gone With the Wind triumphed over Goodbye Mr. Chips, Mr. Smith Goes to Washington, Of Mice and Men and The Wizard of Oz, and 1975, where there were but five nominees for Best Picture, One Flew Over The Cuckoos Nest triumphed over Nashville, Jaws, and my personal favorite, Barry Lyndon. The weakest film nominated for 1975, as it turns out, was Dog Day Afternoon, a classic in it’s own right. Only three movies in history have won the ‘Big Five’ Oscars of Best Picture, Director, Actress, Actor and one of the Screenplay Awards. The First was It Happened One Night, winning Oscars for Harry Cohn for Best Picture, Frank Capra for Best Picture and Director, Clark Gable for Actor, Claudette Colbert as Actress and Robert Riskin for Best Writing, Adaptation. The most recent ‘Big Five’ winner was Silence of the Lambs, with Jonathan Demme as Director, Ted Tally for Best Adapted Screenplay, Jodie Foster as Actress and Anthony Hopkins for Actor. The middle winner of the ‘Big Five’ was One Flew Over the Cuckoo’s Nest and one can’t help but think that this distinction was only made possible because Louise Fletcher’s competition in the race was bereft of heavy hitters – her true competition had to be Isabelle Adjani for The Story of Adele H. and who properly should have won as she actually played a leading role – and she somehow managed to be elevated up from the Supporting Actress catergory, where she rightfully belonged. One Flew Over The Cuckoo’s Nest featured, in one of his earliest roles, Michael Berryman playing the role of Ellis, one of the chronic patients at the hospital who never utters a word. Interestingly, I most closely associate him with the role of Pluto in Wes Craven’s great little thriller, The Hills Have Eyes, which costarred future Academy Award winner Robert (Bobby) Houston. In addition to Michael Douglas, One Flew Over The Cuckoos Nest was produced by Saul Zaentz. In spite of whatever past he may have with John Fogerty, Zaentz holds the distinction for being one of two men to win three Oscars for Best Picture – for One Flew Over The Cuckoo’s Nest, Amadeus, and The English Patient. The other with three Best Picture Oscars? 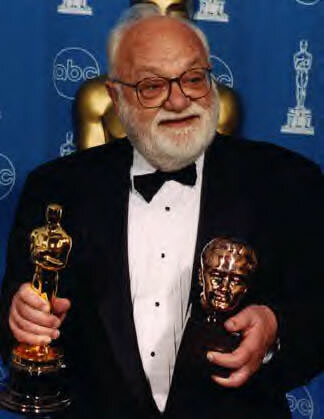 Sam Spiegel for On The Waterfront, Bridge on the River Kwai and Lawrence of Arabia. Both men were also recipients of the Thalberg Award – Spiegel in 1974, Zaentz in 1996. However, Spiegel’s career might be a little more impressive because he was nominated a fourth time for Best Picture, for Nicholas and Alexandria. To see the list of those seen and those yet to be seen, click here.